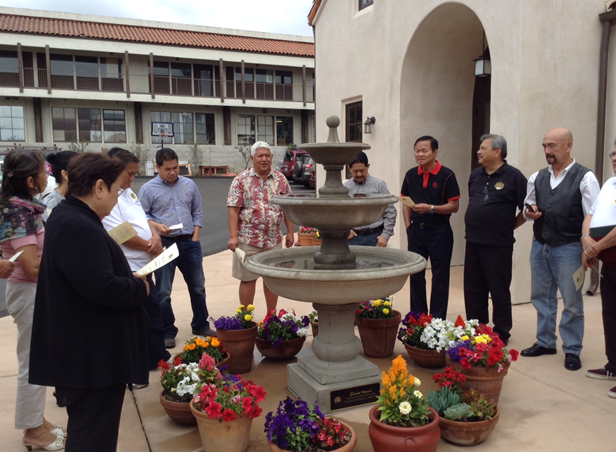 On May 24, Pastor Alexander Achacoso, a University of the Philippines alumnus, led his visiting fraternity buddies in dedicating a commemorative fountain, part of the cosmetic phase of the church rebuilding after fire wrought damages day after Christmas two years ago. The cost of the damage was estimated at $500,000 which included building a new sanctuary which was razed by the early morning fire. The cost to rebuild to date is $900,000. “The fire burned down our church, but not our faith,” Pastor Alex who immigrated to the Bronx in New York some 36 years ago told his friends and their families. “God is good; He provides at the right time and proof is how the community around Old Town, our friends near and far, gathered their resources to append insurance mitigation,” he stated to his fraternal friends from the UP Sigma Rho of Southern California Chapter and their families. The latter donated funds to build the “Eternal One” fountain welcoming church-goers to the church. Fernando Sosmena, archon of the SoCal chapter led some 20 members in the dedication ceremony. Fast forward to 2014, after two and half years of fund raising and re-building, Pastor Alex beamed as he led the tour of the new sanctuary among his friends many of whom drove more than 150 miles one way to mark this event. Achacoso has served at the non-denominational Christian church since 1993. It has more than 90 family members; with demographics of 60 percent Filipino Americans and the rest are Chinese, Korean, African Americans and Hispanics. Old Town, a quaint parcel of the early Spanish community south of Los Angeles has approximately 1,500 residents. The other church in town is the Immaculate Conception Catholic Church that has since collaborated with some activities including feeding programs. He celebrates mass every Sunday from 11 a.m. Community leaders also conduct ministries for children, youth and seniors which for two years had to be held at the adjacent school grounds. It becomes a voting precinct for one day for the upcoming June primaries. “Not only did the community restore the demolished sanctuary, they were also able to add square footages by including a crying room for parents with babies and toddlers, as well as an additional function room. The church now has 3,500 square footage with new modern kitchen and dining area. “We’re thankful; the rebuilding is a testament of God’s faithfulness,” said Achacoso. With his wife Irene of 36 years, Pastor Alex moved to the Bay Area in 1983 where religious life called on him, and he entered the seminary. Ten years after, their journey led them to San Diego where the predominantly Caucasian church was closing down. With a family of six children, Alex and Irene have served the Old Church since 1993. They now have 12 grandchildren and a growing community church. His goal as a pastor is to continue initiating mission churches where these are needed – Chula Vista, for example; leading more people to “His Kingdom.” At Old Town Church, he plans to open a veterans’ facility to address some of the mental challenges this group faces, a rehabilitative mission. Side by side with this mission is to strengthen the veterans’ spiritual side as well as their faith. The Old Town Church is situated in a tourist area visited for its history and local crafts at a laid back, almost pastoral setting. Besides the sanctuary, several items inside the church, which was built in the 1970s, were destroyed, including a carved sculpture called an intaglio that depicted the Madonna and child. The work hung in a handmade wooden frame above the altar, said Achacoso’s wife, Irene. A previous version appeared in Inquirer.net , a content partner of The FilAm Los Angeles. 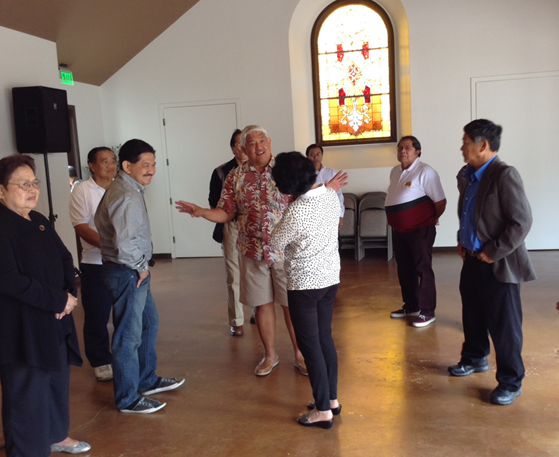 Pastor Alex shows visitors the new sanctuary made from the stained glass salvaged from the fire.